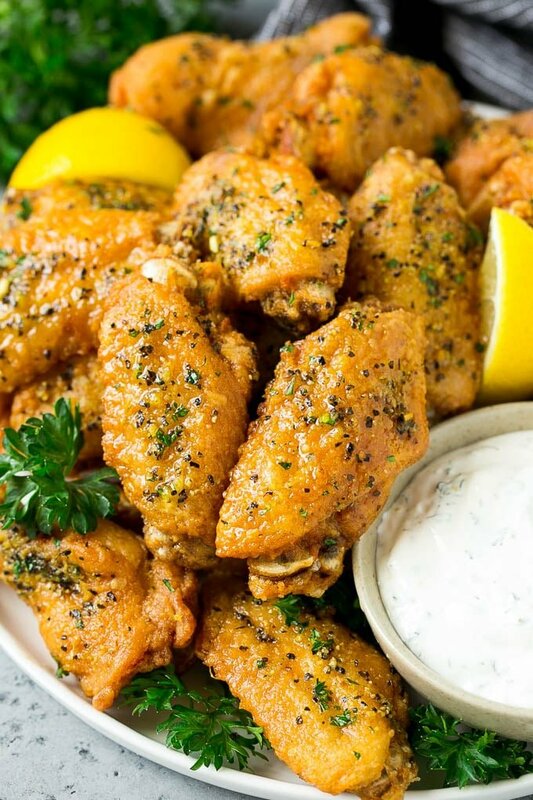 You can’t eat just one of these deliciously addictive lemon pepper wings! They’re great for game day, or serve them over mashed potatoes with a side of roasted broccoli for a fabulous dinner option. I can never resist ordering chicken wings at restaurants – they’re incredibly crispy on the outside, yet juicy and tender on the inside. 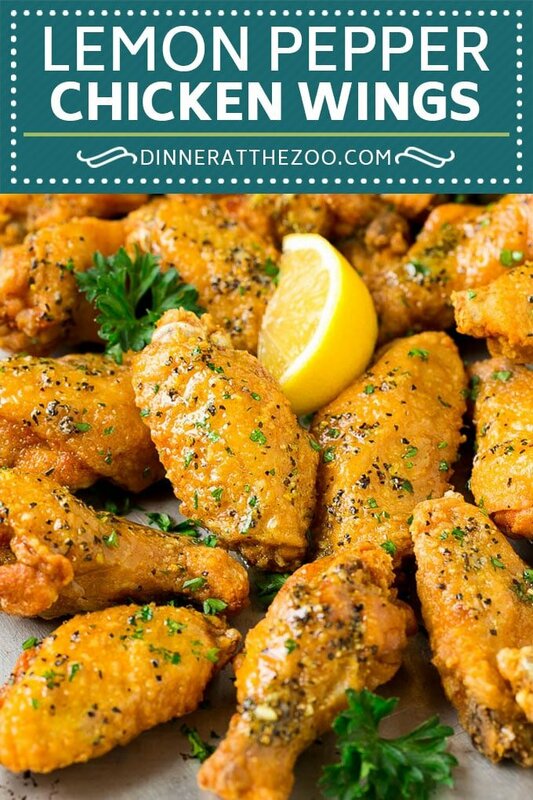 Add a savory lemon pepper butter and you have the absolute best lemon pepper wings imaginable! 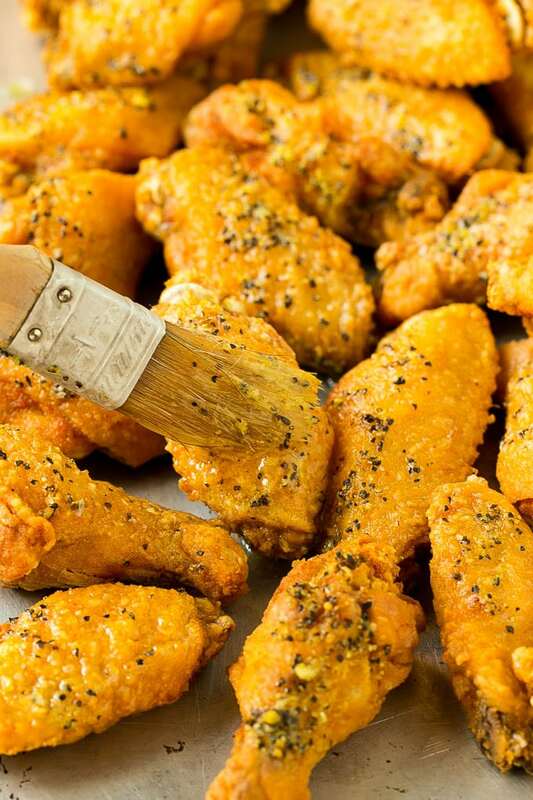 How do you make lemon pepper wings? 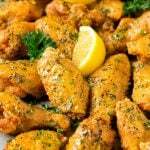 This recipe starts with party style chicken wings, which are simply chicken wings that have been cut into two pieces. I feel that party wings are easier to eat and cook more evenly than whole chicken wings. The wings are coated in seasoned flour, then deep fried until crispy and golden brown. The finish touch is a coating of lemon pepper butter and a sprinkle of parsley. I like to garnish my wings with lemon wedges and sprigs of parsley, but those are optional additions. Use a thermometer to make sure your frying oil is at the correct temperature. You want your oil to be somewhere between 350 and 375 degrees F. If the oil is too hot, the wings will burn before the insides cook through. If the oil is too cold, your wings may absorb excess oil and be overly greasy. I typically use canola oil to fry my wings, although any oil with a high smoke point will work, such as vegetable oil or peanut oil. These wings are best served immediately when they’re piping hot and super crispy. You can serve your wings as-is, or add a dip on the side such as ranch. How do you make a lemon pepper sauce? My lemon pepper sauce is a simple mixture of store bought lemon pepper seasoning and melted butter. The sauce is brushed all over the wings for maximum flavor. 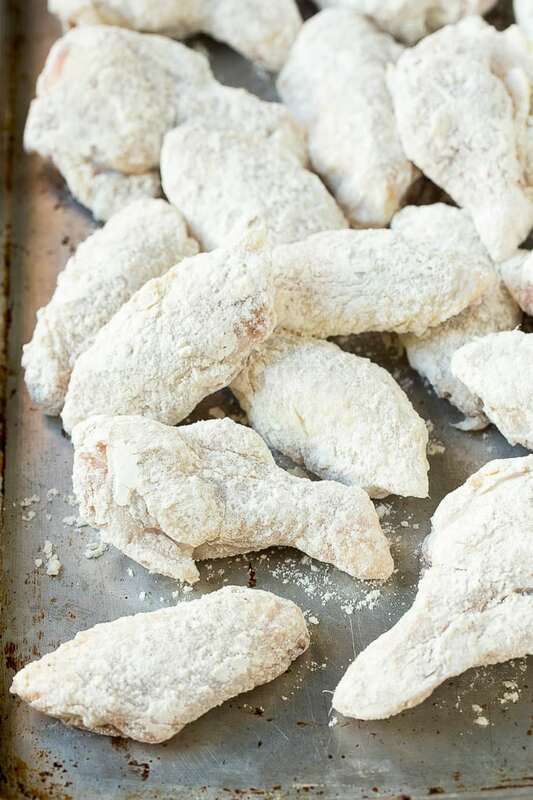 If you prefer, you can bake these wings in the oven. 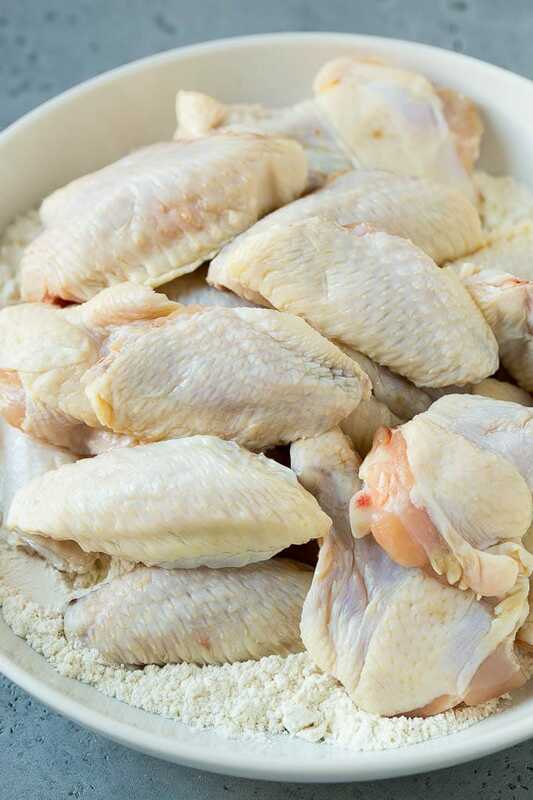 To make baked wings, you’ll want to skip the flour coating and instead brush your wings with 3 tablespoons of oil and season with salt and pepper to taste. Bake your wings at 425 degrees F for 45-50 minutes, or until deep golden brown and crispy. Brush with the lemon pepper butter as directed in the recipe, sprinkle with parsley, then serve. You won’t get quite the same coating as you will in the frying method, but the baked version is still totally delicious! If you love lemon pepper, you’ll adore these flavorful little wings. They’re a welcome addition to any party, or serve them up as a fun and unexpected dinner option! Heat 4 inches of oil in a large pot to 350 degrees F.
Add the chicken wings to the pot in batches of about 6-8 wings. Fry for 10-12 minutes or until wings are deep golden brown and cooked through. Repeat with remaining wings. In a small bowl, combine the butter and lemon pepper seasoning. Brush the butter mixture over the chicken wings and toss to coat. Sprinkle with parsley and serve. Garnish with lemon wedges and parsley sprigs if desired. These make my mouth water! Going to make them tomorrow! I will have to try this . My family loves chicken wings and their favorite is korean style wings (crispy fried with soy garlic sauce). The lemon pepper sauce sounds like it is also going to be a winner. Thanks for the recipe! So yummy! This recipe is perfect for the Superbowl game party! Thanks for sharing! I love lemon pepper wings! It’s very refreshing and it’s a good finger food. I would love to try your recipe! Yummy! 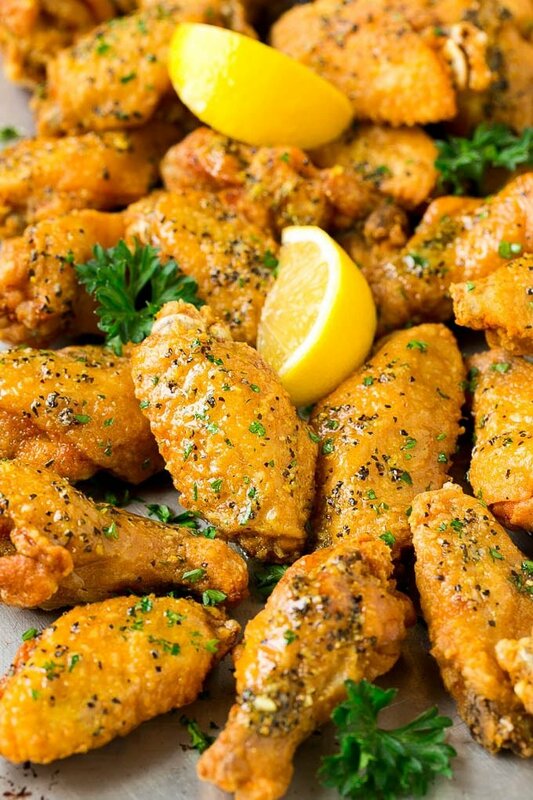 Ok, so I have never had Lemon Pepper wings but it does look really appetizing. The calorie content is also good for such delicious looking fare. I love fried chicken! Your recipe of adding lemon and pepper looks awesome. I’ll add this to my list of new recipes that I’d try. My husband would love these! I am curious how the lemon pepper would taste with cauliflower wings since I’m a vegetarian. I’ll have to try it when I make the wings for my family and the cauliflower wings for me. oh my goodness this looks so scrumptious! i love anything with lemon and pepper so will definitely have to try this recipe. thank you for sharing! I’ve had wings in lots of different ways, but I’ve never had lemon pepper wings. Those look so good!